I am someone who loves quotes ... any kind of quote, if it makes an impact on me, I write it down in a book I have of speeches, quotes, phrases, or even fortune cookies that I have collected over the years. However there is one quote from a song by Lifehouse that has really made an impact on me over the past few years and I seem to always fall back on when I'm having a rough day. While it may not seem like it at times, you can be whoever you choose to be and there definitely may be obstacles but you have choices. And we find strength within ourselves not when life is easy, but rather when it challenges us and makes us work to get through something. 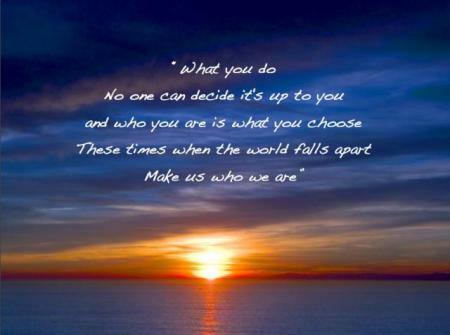 Those tough times, when the world falls apart, we really do find out who we are and what we are made of.